Touch picture to scrollThe Caribbean Takeaway is an important cultural meeting place in the Caribbean community. A home from home, the kitchen is where meals are prepared, but also where stories are exchanged and shared. Going back to African roots, cooking and the Dutch pot or cooking pot was the central place for the family activity. The takeaway has just as much cultural importance as the barbershop and the hairdressing salon for black communities living and working in the UK. 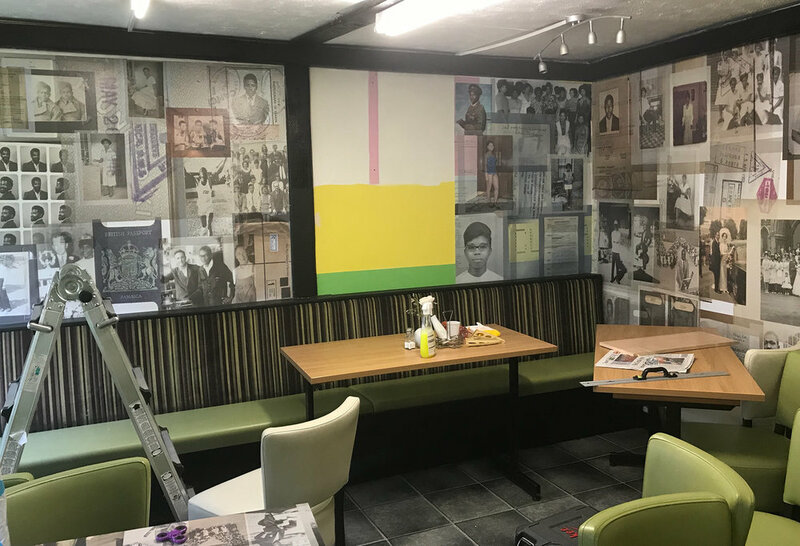 Artist EVEWRIGHT devised a further intervention in the takeaway café space created wall and table collages in conjunction with special limited-edition portraits of the participants using photo etching as a medium. The art installation is an immersive experience which depicts present images but also fading thoughts, aspirations and memories created to document and reflect participants lives. Even some personal documents are shown such as one elder’s original passenger ticket that he bought for his passage to England in 1961 also a letter of a family member in the Homeland asking to receive financial remittance. 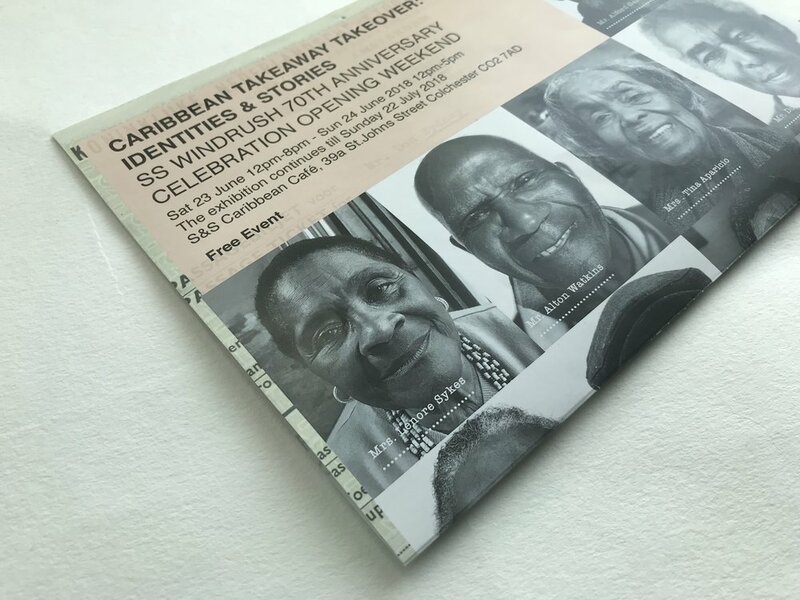 This project, Caribbean Takeaway Takeover: Identities and Stories, is exhibited free to the public at S&S Caribbean Café & Takeaway, a focus for the black community in Colchester UK. Although the story of migration has always been a current one, this installation helps to give insight into the lives of these ten British adventurers from the Windrush Generation. The space is taken over, repurposed and transformed into an art installation where sound recordings of the elder's stories are played throughout the day. The takeaway will continue to function as an eatery allowing visitors an opportunity to sample Caribbean cuisine and experience the stories in a unique environment. E-S-P Evewright Studio Productions were instrumental in the takeover process by firstly producing a detailed on-site survey. The creative considerations were numerous from inventing a unique colour palette and design template, that was then transfered to the complete interiors of the space, but also to the digital and print marketing campaigns. 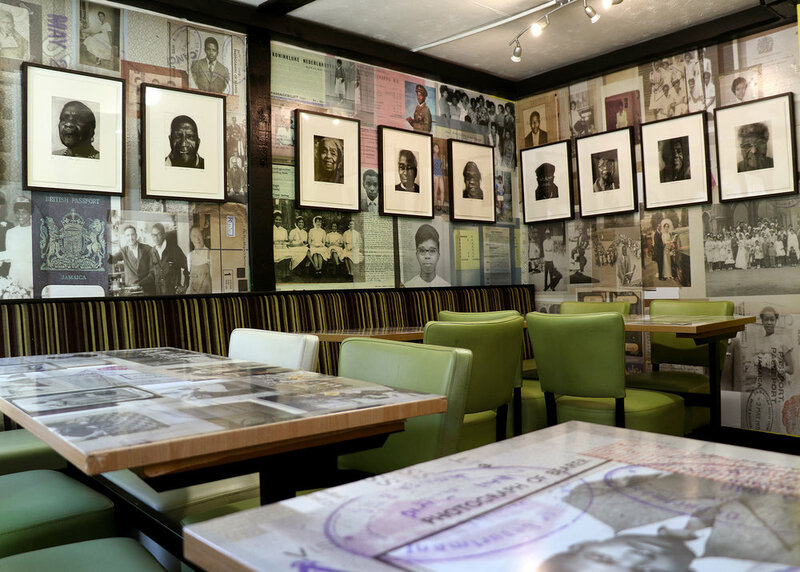 Caribbean Takeaway Takeover all the wall and table artwork produced by ESP as the backdrop to the stunning etchings. E-S-P stop motion animation film 'British Alien' shows at Firstsite Gallery as part of 'The Britishness Project' exhibition. EVEWRIGHT STUDIO PRODUCTIONS (E-S-P) worked with students at Harwich & Dovercourt school, using drawing, stop motion animation to produce an exciting film installation that explored several themes about what it means to be young, British and different in the United Kingdom today. For many of the students this has been the first time they have worked with moving image in combination with art as a means of expression. 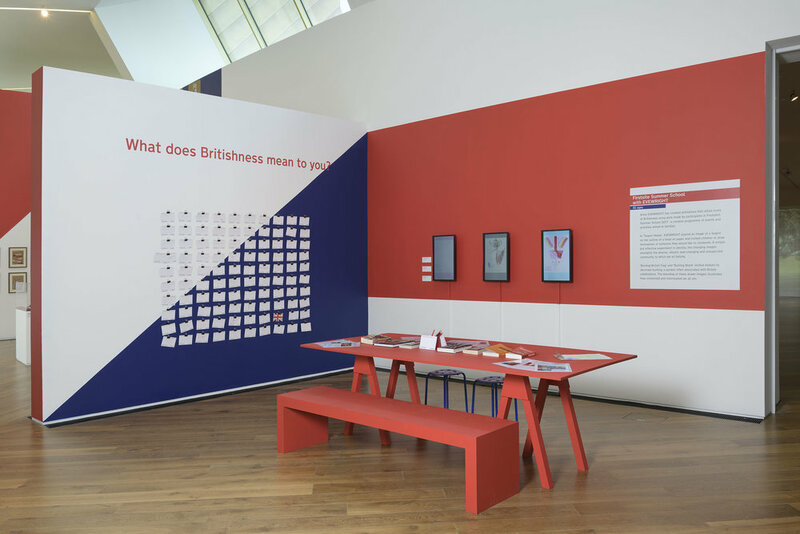 The Britishness Project' is a groundbreaking exhibition that explores national identity through art. From September to December 2017, eight professional artists undertook residencies for one term at seven schools and education organisations in Colchester, Harlow and Harwich. 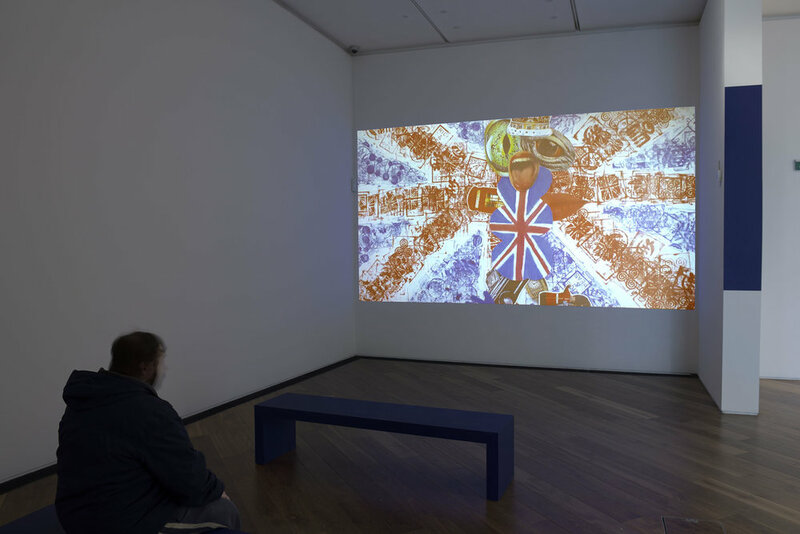 During this time, the artists and students aged from 7 to 16 investigated notions of Britishness through art-making. The project used engagement with visual arts to enable young people to explore issues of identity and Britishness in the context of the recent European Referendum. Artist EVEWRIGHT has created animations that utilise icons of Britishness using work made by participants in Firstsite's Summer School 2017 - creative programme of events and activities aimed at families. In 'Tea Pot Heads' EVEWRIGHT placed an image of a teapot on the outline of a head on a paper and invited children to draw themselves or someone they would like to celebrate. A simple but effective experiment in identity, the changing images exemplify the diverse, vibrant, ever-changing and unexpected community to which we all belong. "Bunting British Flag" and "Bunting Blank" invited visitors to decorate bunting, a symbol often associated with British celebrations. The blending of these drawn images illustrates how connected and interrelated we all are.